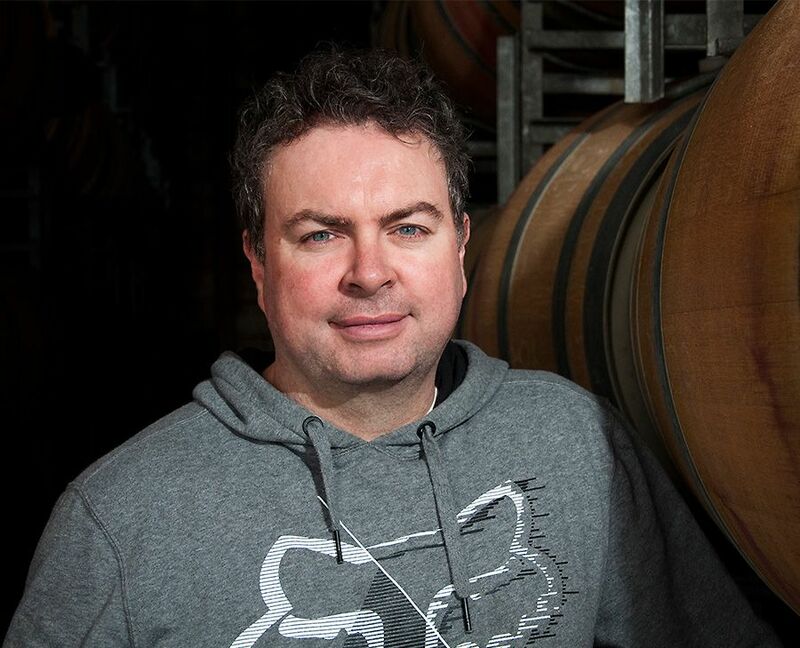 In an earlier interview with David Lloyd, winemaker at Eldridge Estate on the Mornington Peninsular he suggested if I ever got down to Coonawarra I should catch up with the ‘Prof’. I have enjoyed Majella wines for years but did not know much about them or that the ‘Prof ‘ was Brian Lynn one of the Lynn brothers. An early shot of the ‘Prof’ from the family album by photographer Tait Schmaal. Your nick name ‘Prof’ where did that come from ? Its a long story… but the short version is that I talk a lot. The real version is that I was the only boy in a small, country Catholic school in Penola who wore glasses. I got them between grade one and two. When I turned up, someone said, “Lynny looks like a professor with those glasses on ! ” and it stuck all the way through. I could have gone on to be a professor. I had a full Commonwealth scholarship, I was a good student, got plenty of A’s in Year 12, and my mother wanted me to do medicine, or law, or both. I finished up on the farm because while Mum wanted me to go on to uni, Dad wasn’t too sure. I was sick of study and decided I’d have what is now called a gap year, I delayed the job by 12 months, came home and started to work on the farm. There’s a few doctors and lawyers who are pretty pleased I didn’t go ahead with it because they’d rather drink the wine we make. What lead the family to plant grapes ? Mum and Dad were sheep farmers, prior to that we were grocers, prior to that you name it, …. we were wheelwrights, blacksmiths… we did a lot of things. The family has been hanging round the district since the foundation of Penola – around 1855. Dad was working in a grocer shop; he got out of it when he was about 17 or 18 and he and his Dad bought a property. 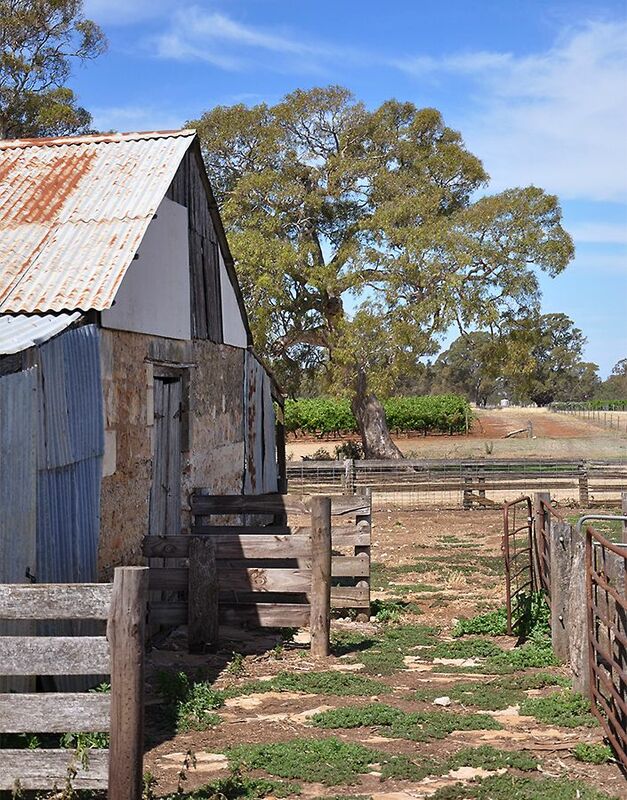 Majella’s coonawarra shearing shed : Photo © Stella Scanlon. So just after the war, when he and mum got married, they were already farming. Our original farm is 10 miles south-west of here on the way to little place called Kalangadoo. 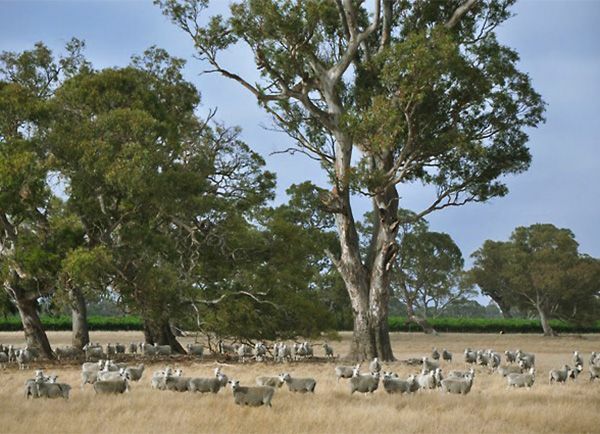 Dad bought this Coonawarra property in 1960 from his uncle, to grow prime lambs on. It is really good lamb country… it’s reasonably high and it’s dry. There were vineyards around at that time- Coonawarra had been going since 1891. The history of Coonawarra is of waxing and waning… you had the boom until World War 1, then it all sort of fell over. Things started to pick up a few years after the war – then it headed into the depression – then World War 2. 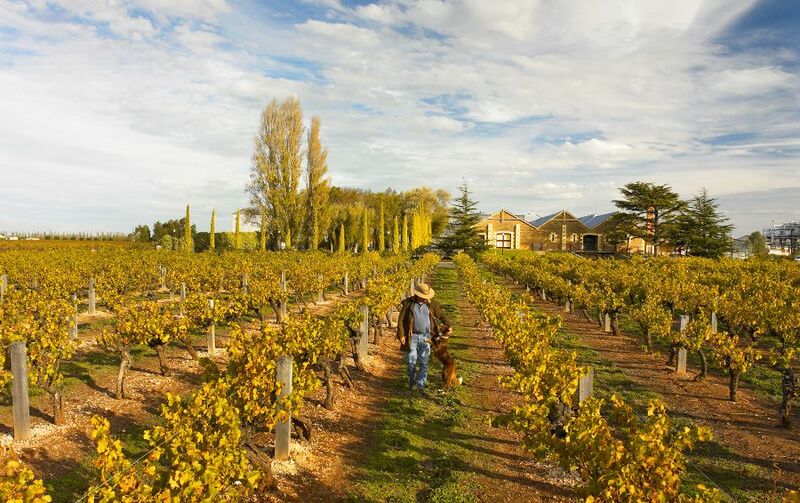 Coonawarra started as a fruit colony which included grapevines amongst other fruits. Australians weren’t drinking dry red table wine then, which is what this area is suited to. 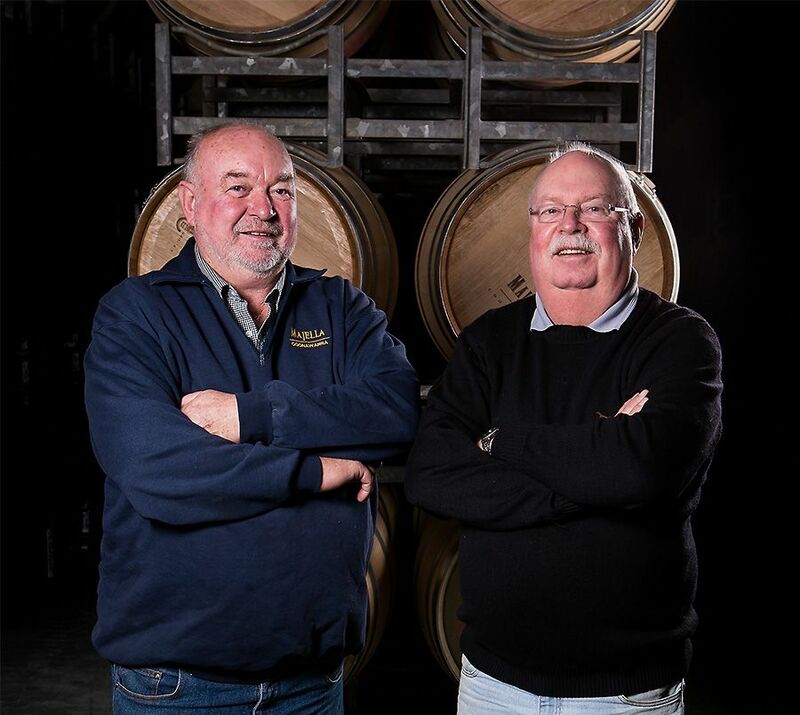 They had a distillery here and tried to make Brandy, Port and fortifieds… but it didn’t really take off until David and Samuel Wynn came here in the early 50s and bought the winery we now call Wynns. The historic Wynns winery in autumn : Photo © Milton Wordley. We planted vineyards because we needed a cash crop to keep me home, something for me to do. 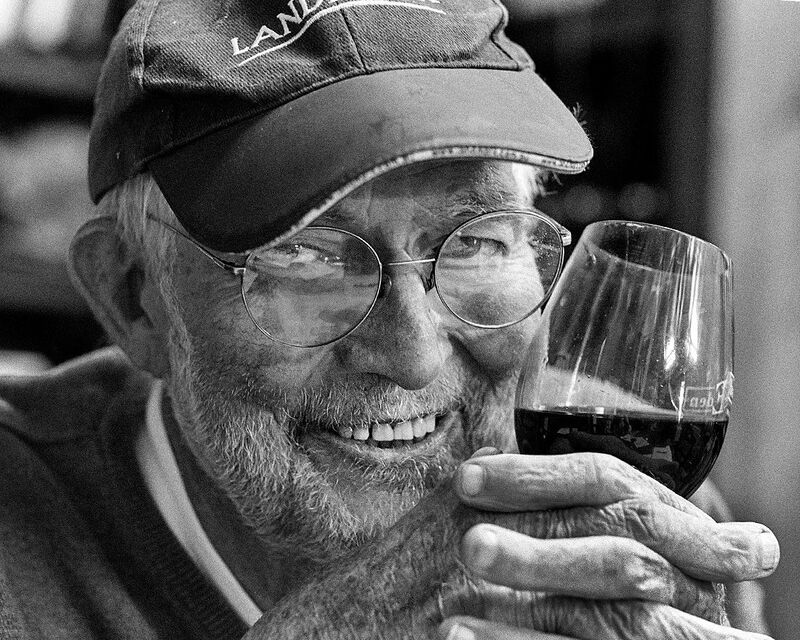 Dad was mates with Eric Brand … Eric had bought the Laira vineyard and started up his own winery. He needed some more grapes and was looking to plant new vineyards. I’d done a project on the wine industry in Coonawarra for year 12 geography, and so Eric said “Why don’t you plant a vineyard on the front block, I’ll show you how to do it and give you a hand. You plant the vines and I’ll buy the grapes.” He had a deal where he was making his grapes into wine – selling it mostly to the old Hardy wine company but keeping a little bit back to start his fledgeling Laira brand. He needed some more grapes, so he bought ours at the then Commissioner’s Rates – about $110 a ton for shiraz and $125 for cabernet. What were the early days like ? Tony and Brian Lynn : Photo © Christy Radford. Dad was only 50 when he died, I was 25. So Tony and myself were running 4000 sheep and 80 acres of grapevines, we were battling big time. Mum had gone back to work teaching… we were scratching to make a quid. We had one year when the vines went unpruned, or half of them did – we just didn’t have the time to prune them. Mechanisation turned the corner for us. Coonawarra led the field in mechanisation, mainly because there was no pool of labour down here… we really were an outpost. We didn’t have labour hire people to organise pruning and other vineyard work as they do now. 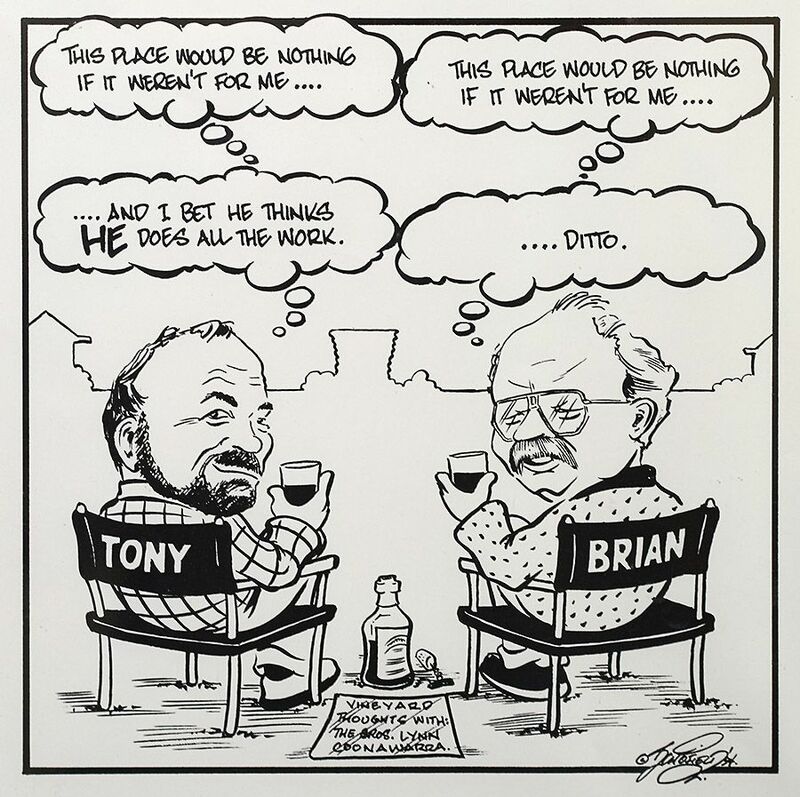 The big boys before the amalgamations, Lindemans, Wynns, Penfolds, Mildara ..as well as us small guys, were all expanding – but we had no labour. Woodley’s 1973 ‘Queen Adelaide’ claret. We had to battle to sell grapes early on, through the 70s it was okay, we were selling to Eric Brand but then his contracts expired. In the late 70s and early 80s we were really battling – people wanted cabernet but we’d make sure they took shiraz as well. We were selling some to Woodley Wines, it was going down into Queen Adelaide. Wade said, “We’re a bit short on shiraz this year, I’ll take you up on that offer..” so they came and picked it. And before you know it we were “whole of crop” growers for Wynns Coonawarra Estate. Our fruit went into white label shiraz and black label cabernet. In 1982, some of our fruit along with the Wynns ‘Johnson Block’ was used to make the first John Riddoch. Similarly in 1990 when Peter Douglas made the reinvented Michael Shiraz from a blend of our grapes with theirs. We knew our fruit was good! Did you study winemaking ? I’m not a wine maker and in those days you couldn’t go to school and learn viticulture. You could go on to study oenology at Roseworthy but it was assumed everybody knew how to grow grapes. Look, they are very easy to grow, you take a cutting, stick it in the ground and it will grow. I think they are harder to kill than to grow. Majella vines. : Photo © Stella Scanlon. As far as good ones though, it’s still trial and error. I read a lot of books and talk to the other fellas, keep talking to other vignerons to see what’s going on. I’ve always said the hardest thing about the wine industry is, my biggest competitors are also my best mates. 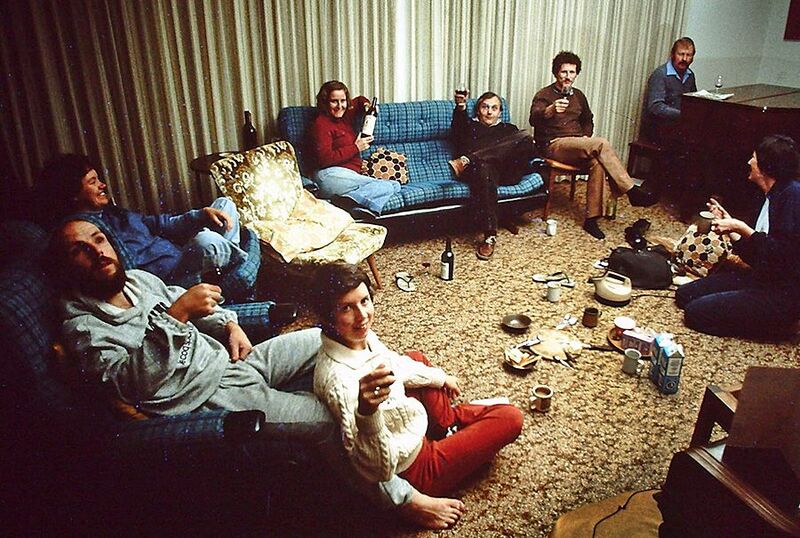 We all know each other, we all drink each other’s wines, mostly we’re pretty good mates, not much vitriol down here. You had been growing grapes for many years, but ‘Majella’ the label started in1991, how did that come about ? 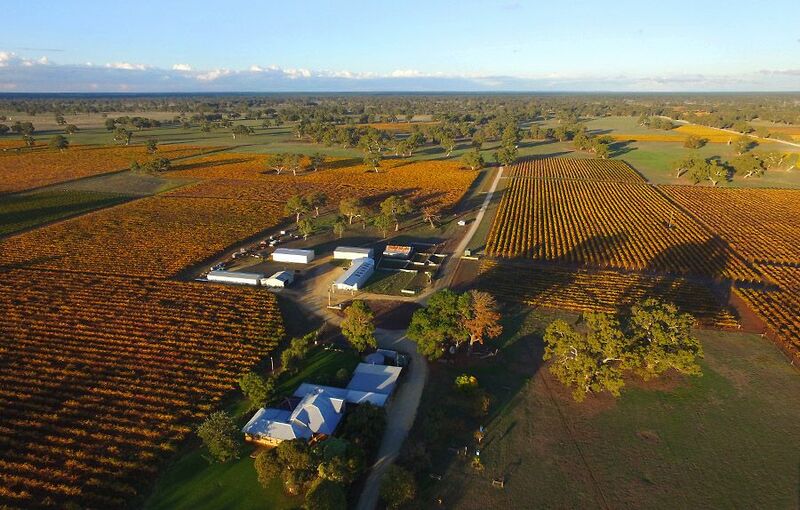 Majella Homestead and vineyards : Photo © Brian Lynn. By the end of the 90s, our contracts had expired, things had picked up, grape prices had picked up. Suddenly we were on the right side of the ledger. Eric Brand had always made a bit of our fruit up in the late 80s and early 90s. 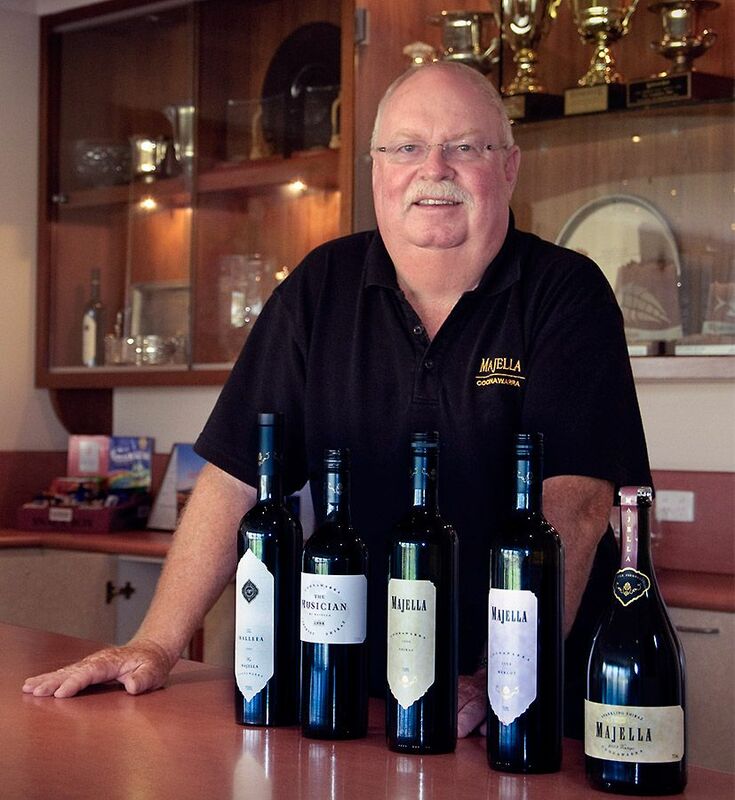 The ‘Prof’ and some of the Majella wines : Photo © Stella Scanlon. So we had this homebrew called Majella. It was just for ourselves, we’d drink it together at parties, give it away as wedding gifts – that sort of thing. Jim Brand overheard this and came to us the next year, harvest 1991 and said “so are you going to go ahead with this thing or not ? I’ve got a tank already for you.” So we picked 10 tonne of fruit, made some wine, and then we had to learn how to sell it. ‘Majella’ : the name, what’s the back label ? That was the name of the farm, my mother being a good Catholic lady, had a devotion to an Italian saint ‘St. 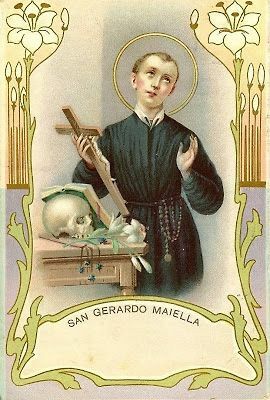 Gerard Majella’ , who was the patron saint of mothers in the old Catholic tradition. 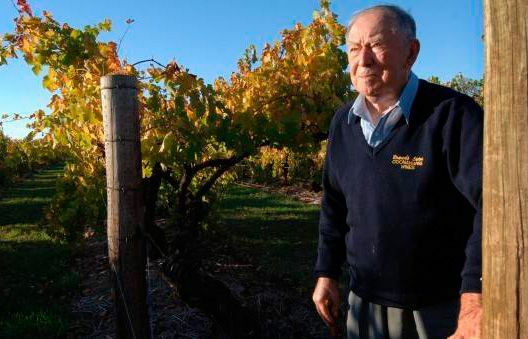 She named the farm Majella after him and the vineyard became the Majella Vineyard. The wine became Majella because we couldn’t think of anything else to call it. Lynns Coonawarra Estate was a bit too close to Wynns Coonawarra estate and Prof’s Home brew was not going to work…so we decided to call it Majella. There is a Mount Majella in the Abruzzo region, east of Rome. It’s a very large mountain – not that high , but big, and it’s got a big national park around it. I’m also a bit of an ‘Italanophile’ rather than a Francophile… I love the food and Italian wines are great, we mostly only see the cheap ones here. Italians drink wine differently than we do…Good Italian wines are made to go with food. Not a bad thing actually. You’re not a winemaker so who makes the wine ? I can tell a good wine from a bad one, but I’m no great wine judge. 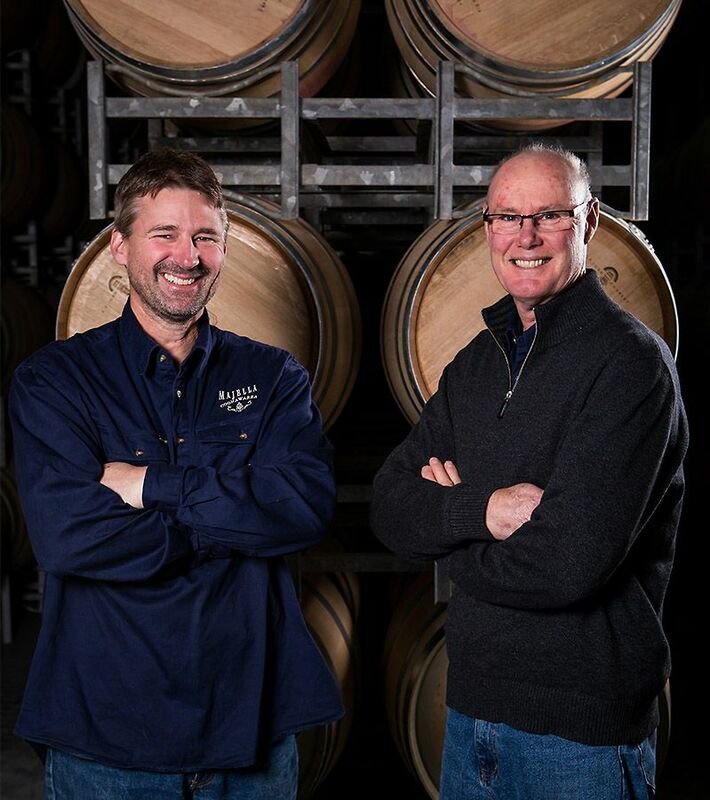 Winemakers Michael Marcus and Bruce Gregory : Photo © Christy Radford. After 50 vintages, I’ve never made a bottle of wine in my life and I’m not likely to either. After seeing it done many times – I know the theory behind it but I’ve never done it. Bruce Gregory has made every bottle of wine we’ve ever made. He made the first one, the 1991 vintage, when he was at Brand’s and he’s been with us ever since. He stayed on after McWilliams bought Brand’s. I’m not sure he was cut out to be a corporate winemaker …so we made him a offer he couldn’t refuse, and he made us a promise – to spend our money for us, which he has lived up to all his life. Winemakers are good at that, spending money that is. Since then Michael Marcus has joined our winemaking team, and he and Bruce are really making some good stuff. Who does what in the business ? Mum lived into the early 90s, she always did the books and I helped her out. It all started to get a bit much for everybody so our accountant suggested a business manager. Peter Lynn, “Global vice president sales and marketing” : Photo © Stella Scanlon. The next generation is coming along – Tony and I each have two children currently in the business. Nerys is our administration manager, Gerard looks after the farm, Peter calls himself “global vice president sales and marketing” and Steven is our vineyard manager. Bruce Gregory has always made our wine, and is now ably assisted by Michael Marcus. Music has always played a big part in our lives. I was a semi-professional muso down here for many years, played at weddings and social occasions things like that. 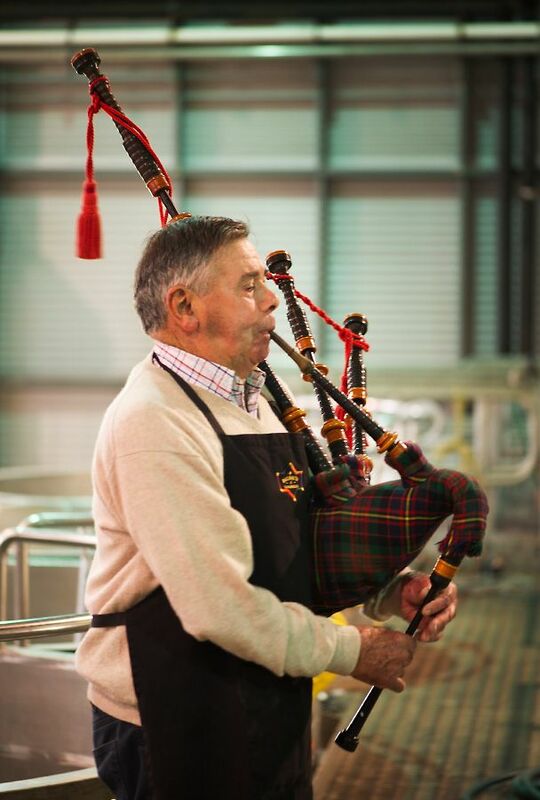 Doug Balnaves on the Bag Pipes : Photo © Ockert le Roux. After I gave up keyboard playing I took up tin whistle; we used to have a band called ‘Phalaris Staggers” (a disease of sheep). Doug Balnaves played button accordion and bagpipes, Bill Brand played the lagerphone, John Williams on guitar and mandolin and I played tin whistle and lead vocals. Our wine the ‘Musician’, is named in honour of my late son Matthew who was a brilliant guitarist. He lived for the guitar and any other instrument that had six strings or even four. He died in 2005, after a road accident in Robe. The Musician is our biggest individual seller, it’s still under $20 and sells all over the world. Grape Growers and Winemakers ? In the old days there was a divide between the grape growers and the winemakers. That all broke down in the 80’s and 90s when each side realised they needed each other. If a winery couldn’t get good grapes, there was no way in the world they could make good wine. Grapes are at their maximum potential when you tip them in the crusher. Mostly they can’t get any better than that…but they can get a bloody lot worse if the winemaker doesn’t know what they are doing. 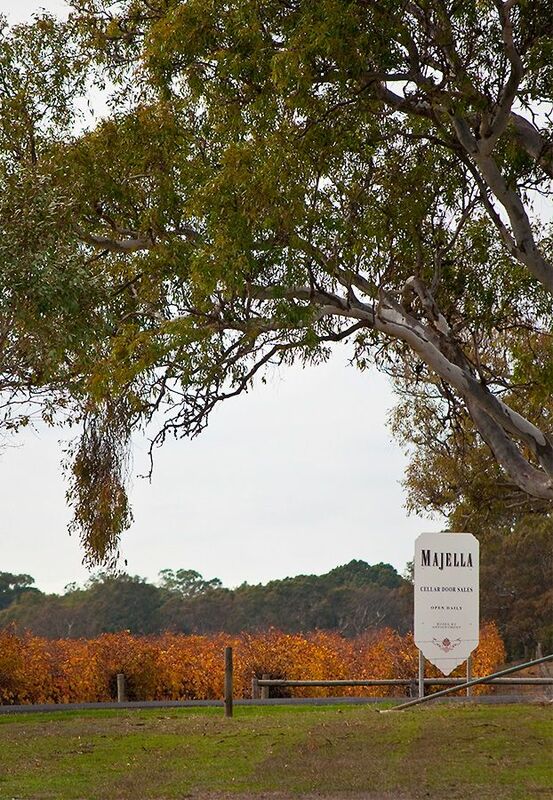 Our promise to all our customers at Majella has always been to try and grow the very best grapes we can, given what the good Lord gives us, and then to try and get that great grape taste and flavour into the bottle. All of our berries now go into Majella wines. Occasionally we have a surplus but not very often. That’s where we are lucky, we have a very good patch of dirt. Why do you think your site is so good ? Sheep and vineyards on the Majella farm : Photo © Stella Scanlon. It started off as a sheep farm, which became a mixed farm with a very good vineyard making very lovely wine. We’ve got a very nice piece of Coonawarra. That was serendipitous. We have a lovely piece of dirt that grows great grape vines. It’s on what we call the hilly side of Coonawarra, we’ve got a few undulations, it’s mostly good terra rossa soils, which run off to the transitional soil in the East. 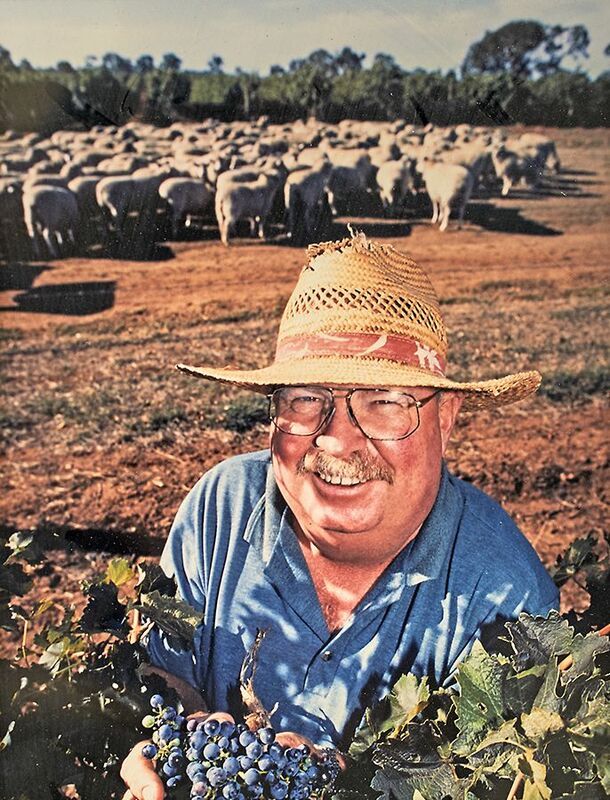 We’re farmers, growing grapes is not much different to growing sheep – it’s agriculture. We are truly a vertically integrated industry; we grow it, we make it, we package it, then we sell it. 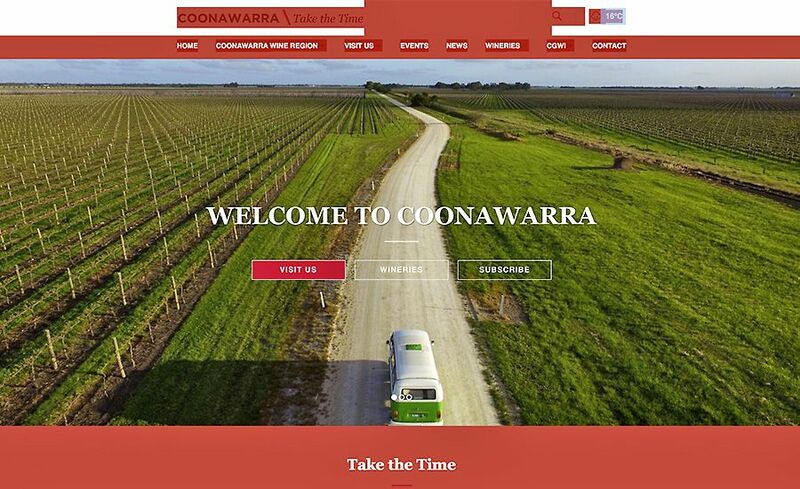 What’s so special about Coonawarra. 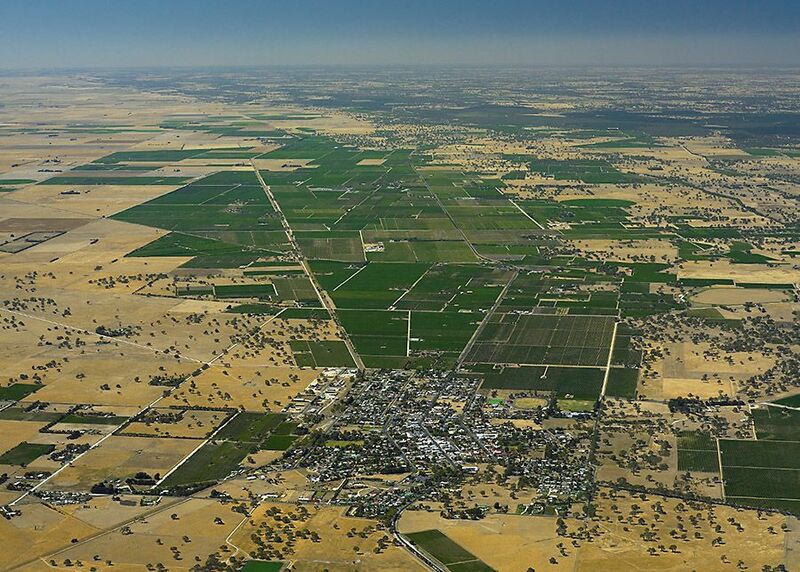 Coonawarra’s long strip of vineyards. Photo : Milton Wordley. I think it’s a perfect climate down here for grape growing. People talk about it being cool climate. 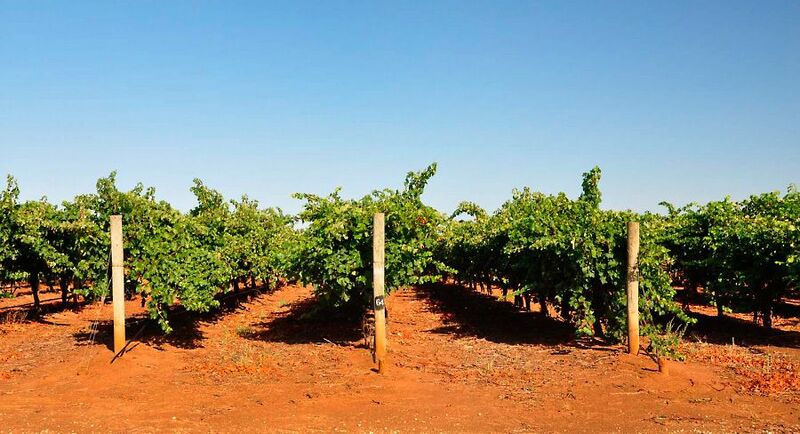 Coonawarra – terra rossa soil profile : Photo © Milton Wordley. It’s 37° today, that’s not cool – people come here in the middle of winter and it’s pouring with rain then they call it cool climate. I like to think this is an optimal climate. What grape vines really like, and this is what Coonawarra can give them, is well drained but not too fertile soil. If the soil is too fertile, the vines get too vigorous, they don’t like wet feet. They want cool to cold, wet winters and warm to hot, dry summers. They also like some intangibles that are hard to measure – diurnal variation is one. Diurnal variation is the difference between daytime and night time temperature – warm days and cool nights. We talk about maritime climate because even though we’re 100 km from the sea – there is nothing between us and the sea. I think the fruit loves that big cycle of highs and lows. To me, it’s the variation of climate that punches flavour into the berries. This is a geological accident that works in our favour. 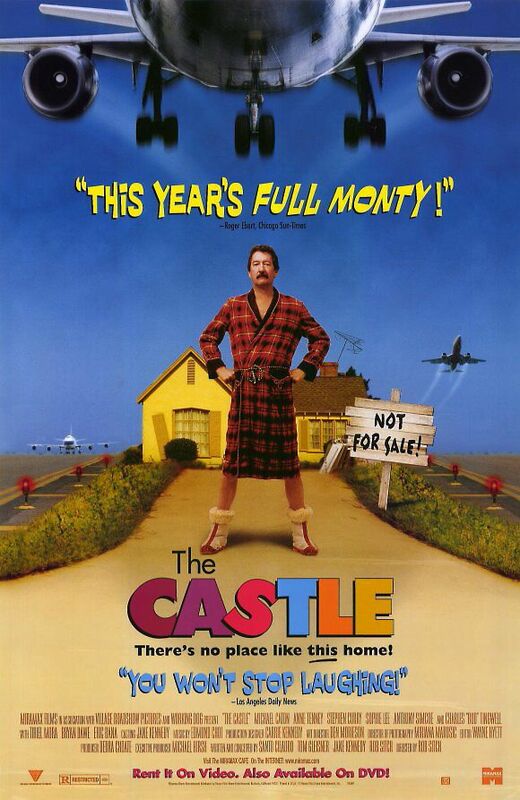 Like they said in the movie, ‘The castle’…. “It’s the vibe”, for us it’s the vibe. 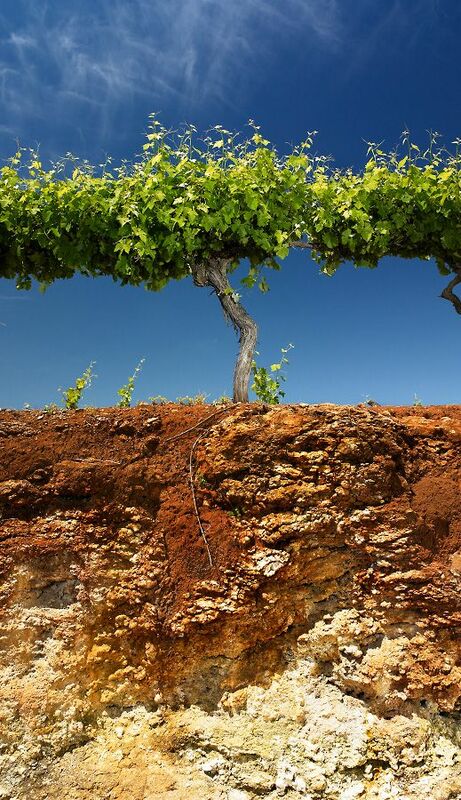 Some might call it the terroir, it’s the soil, the limestone, the climate, it all just works for us. I’m a bit of a climate change skeptic. I agree we haven’t done the best with the environment, and I’m pleased to see we made some changes that way, but not everything is doom and gloom. I haven’t seen anything yet that we haven’t had before, we’ve had hot years, dry years, cold years, wet years… it seems to run in cycles. We have invested heavily in solar, it worked out to be economically feasible over a 10 year period for us to put in solar panels. After the last power failure we thought it’s going be like this for a little while, so we thought it was good insurance to put in a solar system and a 110 KVA generator. It’s an insurance policy – you hope you’ll never have to use it, but if the power goes down as it does, in 10 seconds the generator cuts in. It was a straight business proposition, it all stacked up. Long lunch or dinner ? I’m a bit like my old mate ‘Sir Lunch a Lot’, the late Big Bob McLean. 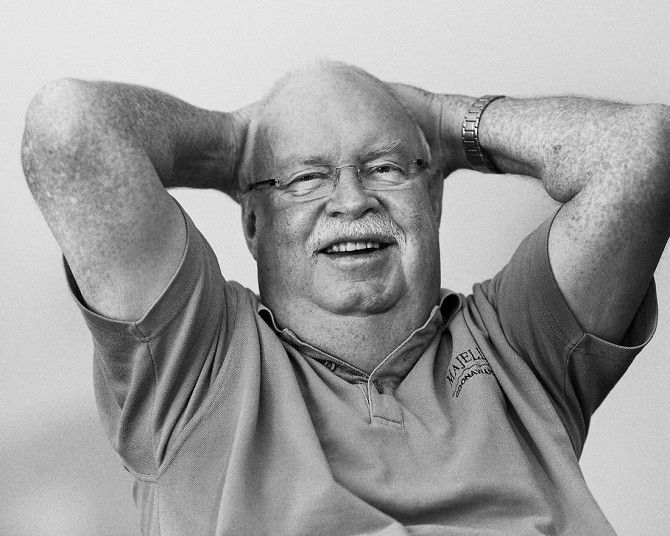 RIP ‘Big Bob’ At home April 1st 2015, a few days before he left us. Photo © Milton Wordley. I remember having lunch in London with a rep a few years ago. We enjoyed a few bottles of very good wine on their expense accounts. I remember settling back after the fourth course and fourth bottle of good wine… Bob looked across and said “Prof, I do like a good lunch !”. ‘Sir Lunch a Lot’ was a great mate, we had a lot in common, I miss him, and yes, like him I do prefer doing lunch than dinner. Not really sure where it’s going ….there have been quite some changes. Hollicks has been bought by the Chinese, I think Ian still has a small share. Rymills is now 100% Chinese. Treasury do their thing… we are a bit of an outpost for Treasury, they have Wynns but half of the winery is in mothballs, everything is going to the Barossa. 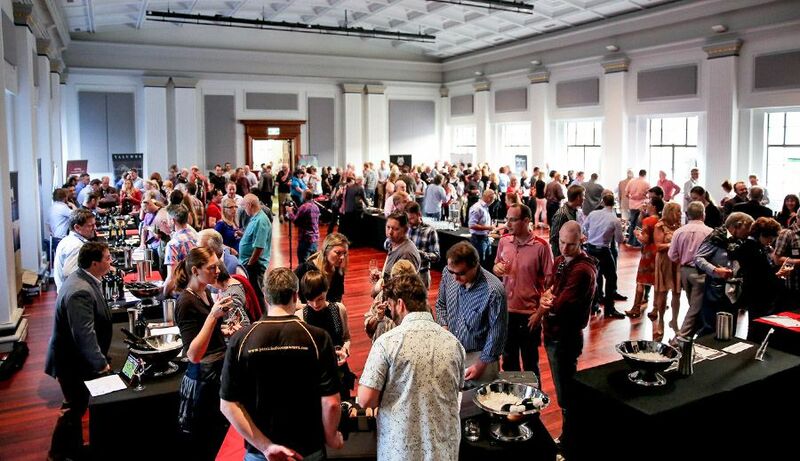 We promote ourselves quite well, the Coonawarra Road show works very well, but our wines have been out of favour for a quite a while….they were in favour but now they are out – its a cyclic kind of thing. When we push Majella, we don’t go into all the fancy wine making techniques and all that stuff. 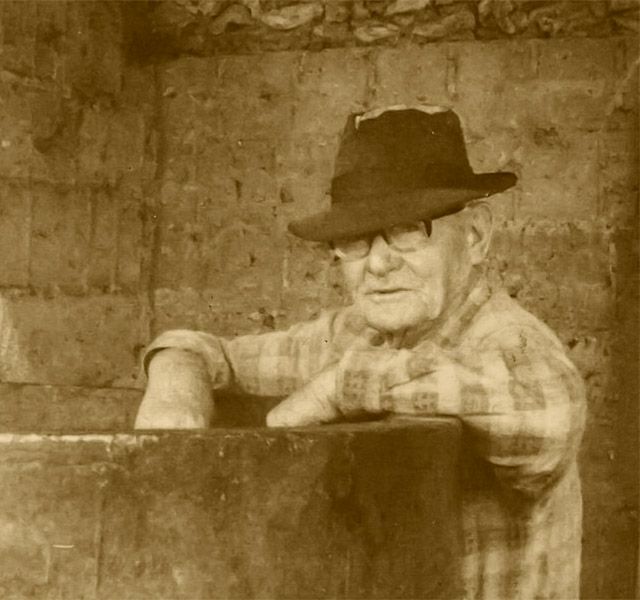 I love the story about Peter Neilson, the wine making brains behind Woodley’s in the late 1940’s. He had a deal with Bill Redman to make the wine down here. It was all stored in the drives or mines at Woodley’s in Glen Osmond Adelaide. There were all sorts of blends and vintages, and he didn’t know what to do with them. He had an idea to put them all together in a distressed box and called it the ‘Treasure Chest’. He got a guy called Witt Morrow to design the labels, very famous was Witt. He designed them as Australian works of art. They were originally printed in one big sheet, all the different labels, over printed with the year, and cut off as needed. They then kept some of the sheets for promotional purposes as works of art. There are three that I know of left in South Australia. The SA Art Gallery has got one, as do we. A great bit of history in wine marketing. Majella’s Witt Morrow ‘Treasure Chest’ label design set : Photo © Milton Wordley. To tell the truth we’ve done pretty well. I enjoy what I do, all of our kids have got jobs, but I’m not wealthy….I would be if we sold it all, but then what’ll I do ….I enjoy it. 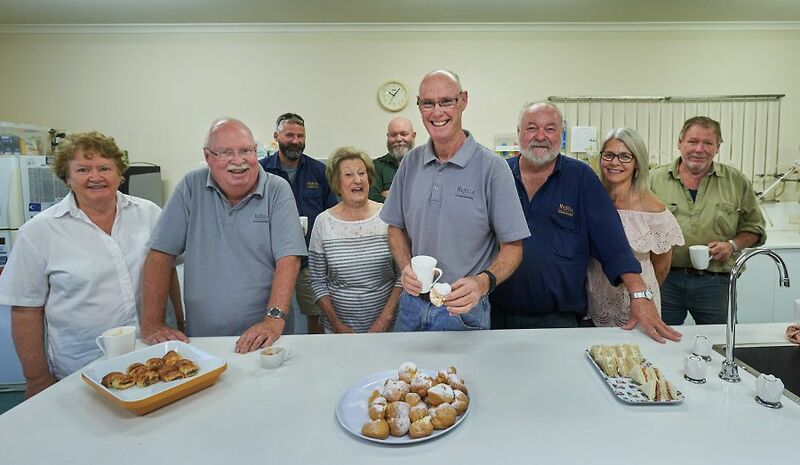 Ten AM morning tea for Bruce Gregory’s birthday : Photo © Milton Wordley. I’m lucky to be here, I saw a spot of blood in my urine last year…went to Adelaide for a CT scan. My urologist John Miller, calls me and says, “Prof you’ve got bladder cancer, it’s big and growing quickly.” A week later I had my bladder out, because I moved so quickly, we got it all. Times are changing and in business there are lots of distractions…but we are a farm. We started as a sheep farm and on a sheep farm there’s a shearing shed… shearing sheds are very regimented. Majella entry : Photo © Stella Scanlon. You start at seven, have smoko at 9.30 and so on… and we do the same – even if its just the two of us – at 10 o’clock we stop, have a cup of tea and a piece of cake… so now we have this thing – if the bank manager wants to see me, he turns up at 10 o’clock. If there is a rep who really wants to show me something, he turns up at 10 o’clock and if he’s really serious… he brings a cake. I call some people and they are always in meetings. They say, “To tell you the truth, probably not – endless meetings about this and that and never any time to get it done” . My philosophy is just make a decision, then go ahead and do it. An old ‘Stock Journal’ cartoon.